This weekend, I had the pleasure to meet Sharon Barresi, author of the blog "Respiri di Vita." I found Sharon through her blog (or she found me, I don't remember which), and we began to correspond about a year ago. She is much more regular in her postings than I am, usually writing just about every day about life as an American ex-pat here in Sicily. Sharon was recently interviewed for a website about Sicily and a link to her answers are on her blog--very interesting insights about Sicily and Sicilians! 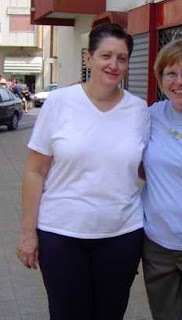 Here is the other half of the photo on Sharon's blog--that's her! Anyway, it was a very please drive to Oliveri, the seaside village where she and her husband Andy live. The town is located underneath Tindari, the famous archaeological and religious site. I had been to Tindari half a dozen times, but never to Oliveri, which is a quiet little town of 2,000 most of the year and a summer mob scene of sun-seekers from England, Germany, Scandanavia, and northern Italy. Sharon and Andy like it better when it is quiet. 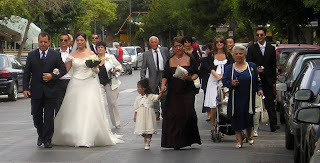 We had a walk around the town which also included photographing a bride literally "going to the chapel" with her whole family accompanying her, as is the custom here. Then we toured the little downtown, the beach area, and "Residence La Tonnara," an old tuna factory that is now a posh vacation condominium. We had a lovely relaxing lunch at home and an afternoon shopping foray to an outlet for athletic wear (including Kappa) in a nearby town. All in all, we deemd it a highly successful visit and hope to stay in touch and visit whenever we can! Bloggers unite!! Come back...you are a great guest! it is an exciting read..and her pictures of Sicily are amazing. Arrivederci & buon fortunato, Mike! "A Big Scoop of Sicily"